There are so many fun things to experience with a baby... and then there's teething. (Even if it is sweet to see baby's first tooth!) In my Armenian culture, we actually gather with friends and family to celebrate this big milestone. 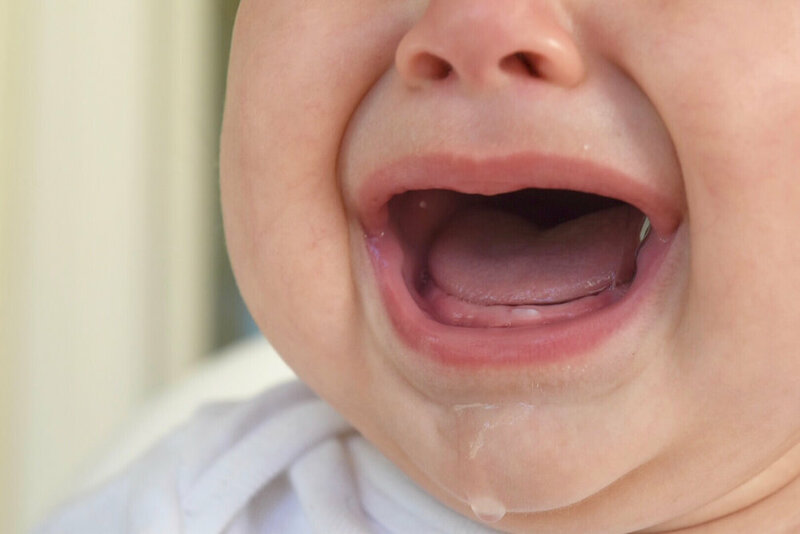 Every baby will have a different tolerance for the discomfort and pain that's associated with teething, so it's good to look out for signs like fussiness, excessive drool, biting more than usual, and disturbed sleep, and be prepared with remedies to make baby happy again. These teething liquid drops are my #1 go-to for teething pain because it's quick and it works! It's made from natural sources like chamomile and can be found in natural food stores like Whole Foods. The drops are safe for use on babies 1 month and older, so if you have an early teether, they're a great tool to keep handy. This baby teether and toothbrush is not only adorable, but perfect for little hands that are just learning how to grab. The non-slip grips are the best for keeping a drooly toy in your baby's hands and off the floor. I especially love that it doubles as a toothbrush so you can teach hygiene habits as soon as baby has her first pearly whites. The banana is also dishwasher friendly—so you don't have to scrub between the bristles—and you can put it in the freezer for a soothing, cool feeling on the gums. Sometimes a good ol' fashioned teething toy is what you need to give baby something to gnaw on. If you have an early teether though, it can be hard to find a chewy toy that they can easily grip and maneuver into their mouths. That's why we prefer Kiki over other popular chew animals... her big ears are super simple for an infant to get into their mouths. Lots of moms swear by the effects of Baltic amber teething necklaces. They're a safe, organic teether known to reduce fussiness, pain and drooling. Plus, it makes for a super cute baby accessory with any outfit. What's interesting is that the beads on the necklace aren't meant to be chewed! Rather, these necklaces are made short enough so that they can't go in baby's mouth. The effects are said to come from the beads touching the skin. It's worth a try for sure! This is a trick I learned somewhere along the way, and every mama should know about it! I take a clean washcloth and drench in freshly-brewed chamomile tea, then I put it in the freezer. A few hours later, I have a cool teether for baby to gnaw on—perfect for warm nights, soothing to baby's sore gums, and super easy to have ready at home. Do you have a trick up your sleeve when it comes to teething? Share with us in the comments!